The Stochastic oscillator is another chart analysis indicator that helps us determine where a trend might be ending. Stochastic is an oscillator that measures overbought and oversold conditions in the stock. The 2 lines are similar to the MACD lines in the sense that one line is faster than the other. 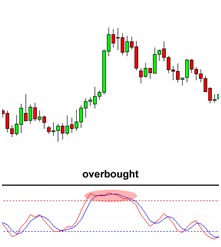 How to TRADE Using the Stochastic As we said earlier, the Stochastic tells us when the market is overbought or oversold. The Stochastic is scaled from 0 to 100. When the Stochastic lines are above 80 the red dotted line in the chart above, then it means the market is overbought. When the Stochastic lines are below 20 the blue dotted line, then it means that the market is oversold. As a thumb rule, we buy when the market is oversold, and we sell when the market is overbought. Looking at the chart above, you can see that the indicator has been showing overbought conditions for quite some time. Based on this information, can you guess where the price might go? If you said the price would drop, then you are absolutely correct! Because the market was overbought for such a long period of time, a reversal was bound to happen. That is the basics of the Stochastic. 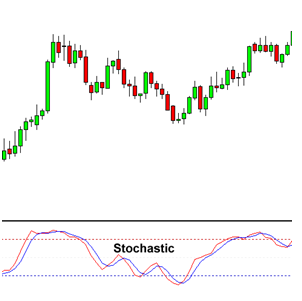 Many traders use the Stochastic in different ways, but the main purpose of the indicator is to show us where the market conditions could be overbought or oversold. Over time, you will learn to use the Stochastic to fit your own personal trading style.